Add a USB 3.0 port connection that inserts flush into a laptop ExpressCard slot. 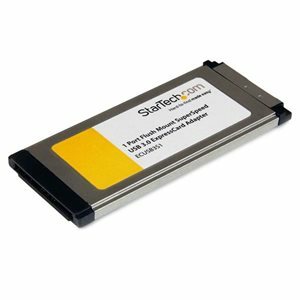 The ECUSB3S11 Flush Mount 1-Port USB 3.0 ExpressCard lets you add a single USB 3.0 port connection to your laptop through an ExpressCard slot.The USB 3.0 adapter uses a unique form factor design that allows it to sit fully in a standard 34mm ExpressCard slot without sticking out. The port sits virtually flush with the sides of the laptop, enabling you to leave the card installed even while on the move, without fear of damage to the card or slot.Enhanced with UASP support (USB Attached SCSI Protocol), this USB 3.0 controller performs up to 70% faster than conventional USB 3.0 when paired with a (Note: UASP requires a compatible operating system). Using a more efficient protocol than the traditional USB BOT (Bulk-Only Transport), UASP technology optimizes transfers by allowing multiple commands to be processed simultaneously, significantly increasing transfer speeds for less wait time on data transfers.The USB 3.0 ExpressCard adapter supports data transfer rates up to 5Gbps, and is still backward compatible with USB 2.0 at up to 480Mbps, or USB 1.1/1.0 at up to 12/1.5 Mbps respectively.UASP is supported in Windows 8, Server 2012 and Linux kernel 2.6.3 or later. In testing UASP performed with up to a 70% faster read / 40% faster write speed over traditional USB 3.0 at peak performance.At the same peak in testing, UASP also showed up to an 80% reduction in required processor resources.Test results were obtained using an Intel Ivy Bridge system, StarTech.com add-on USB 3.0 cards, a UASP-enabled StarTech.com enclosure, and a SATA III solid state drive. UASP is supported in Windows 8, Server 2012 and Linux kernel 2.6.3 or later. In testing UASP performed with up to a 70% faster read / 40% faster write speed over traditional USB 3.0 at peak performance. At the same peak in testing, UASP also showed up to an 80% reduction in required processor resources.